Every team has that one team or one weakness that they could never figure out – that one thing that always end up bringing out the worst in a team. For Cal, that conundrum is Oregon State. The Oregon State head coach, Mike Riley is 6-2 against the Golden Bears, 4-0 in the past four meetings. It seems that he knows exactly what Jeff Tedford is thinking. What is also peculiar is that Oregon State has never lost to Cal at Berkeley during the Tedford era. Maybe it is that Bay Area air that is giving the Beavers the extra strength against Cal or maybe it’s because there is barely any sunlight in Oregon during this time of the year, so when they come down to the Bay they are completely rejuvenated by our weather. Since 2007, games against Oregon State have been disastrous for the Cal Bears. In 2007, Cal dropped from #2 in the nation to nowhere after a close loss against Oregon State where Kevin Riley infamously ran the clock out ending any chance of a field goal to send the game into overtime. After that game, Cal lost 6 games in a row and went from a possible Rose Bowl berth to an Armed Forces Bowl. 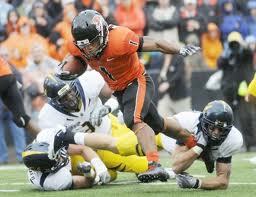 In 2009, Oregon State ended Jahvid Best’s career at Cal when Best leaped into the endzone only to fall on his head leading to a major concussion. After that Cal went on to lose against Utah in the Poinsettia Bowl. Last season, Oregon State ended Kevin Riley’s last season at Cal after an Oregon State defender fell on Riley’s knee, bending it the wrong way. Cal went on to lose that game 35-7, and ended up with a losing season for the first time during the Tedford era. Maybe this time Tedford will add extra padding on players like Keenan Allen. Tomorrow, the seniors of the California Golden Bears will have their last chance at finally defeating the Beavers during their final home game as a Golden Bear. “I’ve never beat Oregon State,” senior right guard Justin Cheadle said. “Whatever it seems to be, we just don’t seem to play well or things go wrong. The great thing about that is we get a chance this week to hit back, and that will be a good feeling. The seniors would love to beat Oregon State”. This time the game will be held at AT&T Park instead of Memorial Stadium, where the Bears always lose to the Beavers. With a victory, Cal will become bowl-eligible and have good momentum against Stanford during the all-important Big Game. Cal will need a great game from their seniors and star players. As long as Cal can have a strong pass defense against Oregon State and the Cal offense can just manage the game with no costly turnovers, the Golden Bears will win the game. Let’s break the curse! Go Bears!